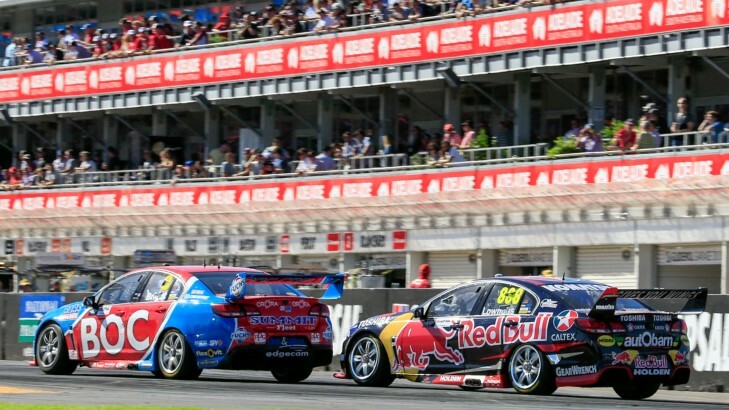 "We had the car speed in all the right places to be able to keep him [van Gisbergen] behind us. He definitely had a faster car there at the end but it was faster in the wrong places. We worked really hard on that and the guys did a great job this weekend with both our cars were really quick and to come away with a couple of podiums is great." "Epic race, it was really cool just pushing the whole way, we were sliding a lot. The last lap through turn 8 was pretty awesome, I thought I was going to have a cheeky dive but he pulled away from me through there, but yeah, just awesome, really enjoyed it." "It's round one of a long year, but it's encouraging signs from our cars. The guys have done an awesome job. Certainly if you look at the speed of the cars over the last three or four races of last year and then carry that over into this weekend - qualifying speed wasn't quite there in my car but the race speed was awesome, I was really happy with the car. So, I'm really enjoying driving the car, the guys are really executing really well, there's a great feel in the garage. It's up to us to do the best job we can and if we continue to do the best job we can, we'll see what happens when pressure is put on the opposition." "Unfortunately it's the first time in a long time we haven't been on the podium on Sunday at the Clipsal 500. I don't mean to be negative, but that was the slowest car we've had around here for a long time. We just didn't find the pace so it was a matter of survival for us. "Unfortunately we tapped, but I feel like I was a bit of an innocent bystander. I was just trying to do my thing and stay out of trouble, but that was that. We'll learn from today and come back stronger next time." "We got a ripper start, made up positions and went for the lap one strategy which was effective. "Eventually we got back in good position but I pushed really hard for those first five or six laps and burnt the tyres up a bit but gained position. "At the end of the race, the car and those tyres were not digging into the track. When you're not good enough you've just got to survive and stay straight and we'll go back to the workshop and have a good look at it and work out a plan. "P5 is probably better [than] where I should have [been] given the car pace but we raced hard and got through which is good." "We were affected a little bit at the start, we didn't have the best tyres to start the race so I feel like that didn't help us and a couple of guys got the jump on us. We didn't stop on either safety car and we weren't to know that they would be so close together. So I think in terms of strategy, it cost us just a bit. Then I got stuck behind a group of 3 or 4 cars and it was hard to pass. We were lucky to stay out of that last lap incident too. To come away with a 6th, 3rd and 1st we're leaving the weekend really happy. It's a great start to our championship." "We had a couple of safety cars, but for that last stint we were absolutely on qualifying pace every single lap, so it was quite tough on us. "For sure we would have wanted to be a little bit further forward at the finish, but to come out of here with a points bank like that is a good start to the year for us." "I think we deserved a better result. The car was actually working really well in the race. We also had a brand new set of tyres for the last run, which we maximised. We just got caught up in a bit of traffic, but all in all I'm not too disappointed. "Sure, we'd like to be up further, but we're making progress. The car is feeling great, we've just got to qualify better. If you want to look at our Achilles heel this weekend, I think our qualifying let us down, starting too far back. We'll sit down and review the strategy, but it definitely put us back into the mix of the traffic, which hurt us a lot as we used up a lot of the tyre to get past people. Once we were past them though, it was easy to pull away. We'll sit down, have a debrief and regroup." "The biggest thing for me for the weekend was to come out of Clipsal with good points for the championship and not be on the back foot. "We didn't qualify well, but I'd set a goal in my own mind of getting into the top 10. Luckily we survived a couple of close calls during the race and the carnage at the end to scrape in. "It's always good to be further up but I'm happy with how we got through the weekend and it has given us something we can build on for the rest of the year." "We were running ok. I think towards the end of the race I bent a shock hitting one of the chicanes at turn one as I went in a little bit hot. From then I was struggling to pull it up and turn left. I thought we had the best pace mid race. I don't think we maximised our potential here this weekend. We've got a lot left. We're in the Top 10, we're in a great spot as a team; all 3 cars have had a good weekend and I've left here with a straight car. I think the way we are working together this year is great. It's been a better start to the year than previous ones, so let's keep that going." "We really did have a Top 10 car today, but our fuel strategy did not work as we put in more than we needed to and it tumbled us down the order a bit too far. The qualifying this morning was a big lift to me and the team. The DJR Team Penske boys were working hard and I felt the car was a better race car today for sure. "All in all a great start for us. We will lick our wounds a bit, have a good think about the weekend and really use the Grand Prix to further develop the package and team and head to Symmons Plains for Round 2." "It's disappointing that we had a power steering failure with a couple of laps to go - we lost about four spots. "I have to say though, it's an absolute credit to everyone at Nissan Motorsport - not just the guys on my car but the whole team - it great to see everyone do everything they could to get my car back on the track after my incident yesterday. "From where the car was yesterday to where it was today, it was a mammoth effort and I can't thank them enough." "It is a very tough race. My mission objective was to finish all the races and not scratch the car and we achieved that. I am slightly happy that I've been able to do that ahead of getting the FG X so hopefully it is onwards and upwards from here. "At no point during the race was I quick. I couldn't extra the pace I wanted which was frustrating. The Grand Prix will be a great learning experience for me and we'll no doubt throw a few things at it to learn as much as we can before we get to Tasmania at the end of the month." "Firstly, really proud to be a part of the team. We have made some gains over the weekend and we are heading in the right direction. Every qualifying session we were faster, every race we were faster. Looking forward to the Grand Prix and a couple of changes to come between now and then." "The final race was one of the toughest races in my life as my cool suit effectively was lost due to an alternator issue. It has been a bloody tough weekend and we deserved more. But I still think we should be proud, the car speed has been great all weekend and we are going to fight back." "Unfortunately we had the pace but the front roll bar broke 20 laps in so were struggling from then. Then the trans axel broke too so it's disappointing but it's just the way it is. I'm glad we got some points in the end which is important for the championship." "I am gutted. To be on the last lap of the Clipsal 500 with a good bag of points in line and to get nothing is tough. I am not quite sure what happened to be honest ... we now have to look forward to the next few events and start clawing our way back. We leave here better off than we did last year and if we finished that last race it would've been amazing but that isn't the case."